Extending a playdate that began when Universal threw out most of its Hasbro toys in a fit of pre-Battleship pique, only to have Sony realize that Candy Land has just enough established backstory to prop up a lolling Adam Sandler, Sony, Hasbro, and Sandler's Happy Madison company have announced plans to also team on a Tonka Trucks movie, because that is the level of discourse of modern filmmaking. "Do you like Tonka Trucks? Vroom vroom," a Hasbro executive essentially asked, his line of inquiry instantly becoming a formal pitch for an animated family movie once representatives from Sony and Happy Madison enthusiastically agreed that, yes, they do like Tonka Trucks while making the sound of screeching brakes and slamming into each other. "No, Tonka goes GRRRRRRRRR," Sony's animation president Michelle Raimo-Kouyate clarified while scooping up mounds of dirt and arranging it into a sloppy pile, a sentiment that was then translated into a more formal statement regarding the hiring of Grown Ups screenwriter Fred Wolf reading, "Fred and our friends at Happy Madison and Hasbro have a truly inventive take on what it means to be ‘TONKA tough’ that will translate the multi-generational appeal of this world-renowned brand into a fun animated adventure for the whole family." 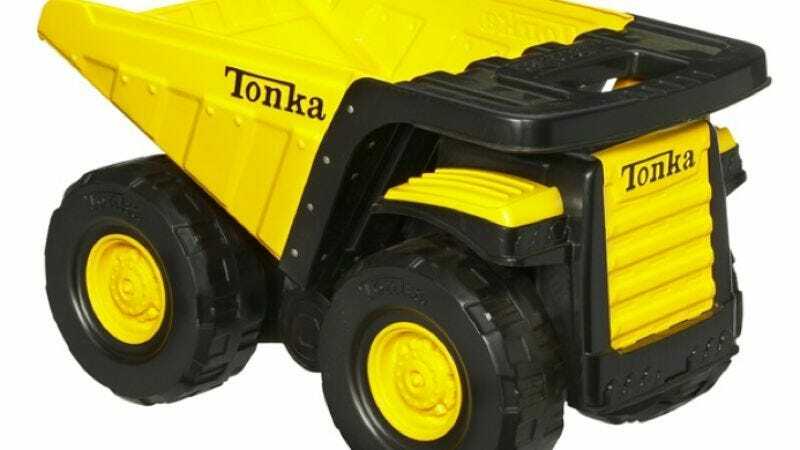 While this new, inventive definition of "Tonka tough" will only become apparent once it's announced which among Sandler's regular company will become a shouting cartoon truck, Sony Digital president Bob Osher did promise that the film would respect Tonka's 65-year legacy as a "rite of passage," wistfully reflecting, "Time spent with these toys creates memories that last a lifetime as kids are inspired to play using the boundaries of their imagination." Osher then demonstrated the importance of said imagination by developing an Adam Sandler-produced movie about trucks based on a licensing agreement with a toy company.